LE BOURGET, France — Until a round of United Nations climate negotiations began in Paris last week, a goal of curbing warming to less than 1.5°C (3.6°F) seemed largely forgotten, overlooked in favor of the status quo, yet immensely challenging, goal of curbing warming to less than 2°C. Following a scientific review that was published by the United Nations this year, and following intense campaigning led by island and other low-lying nations in negotiating halls and on social media, the idea has become a popular one during the second and final week of the key round of U.N. climate talks. 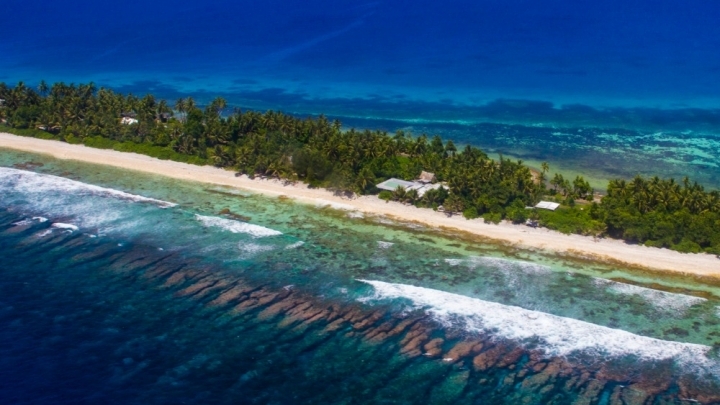 An island in Tuvalu, a nation vulnerable to rising seas. Delegates from the U.S., Canada, China and the European Union have all expressed support in Paris for including a 1.5°C goal in what could be an historic new climate pact, the Guardian reported. Fossil fuel burning and other industrial activities have already raised global temperatures by an average of 1°C since the 1800s, pushing sea levels up more than 8 inches. Island leaders worry that 2°C of warming will render their nations uninhabitable or entirely sunk; they point out that similar fates could befall major coastal cities, such as New York and London. The latest draft of a hoped-for Paris agreement, released over the weekend, contained two options for a temperature goal — “below 1.5°C” or “well below 2°C” above pre-industrial levels, both of which might be included in a final version. If negotiations stay on schedule, it may become clear on Friday whether the ambitious goal will be formally adopted at the U.N. That’s when the talks are scheduled to finish, though similar meetings in previous years have spilled into weekends. Sopoaga said the proposal to include the 1.5°C goal in a Paris agreement is receiving little resistance.